5. The End of Art? To the despair of artists and intellectuals, the positive and uplifting worldview fostered through Modernism has become corrupt and oppressive. Riddled with doubt about the continued viability of the notion of progress, the façade of modernism has begun to crack, and conservative forces that have long been opposed to modernism have rushed, wedge–like, into the interstices to fill and expand the space with their own worldview. In the United States, modernism, in a form identified as ‘secular humanism,’ has been attacked by the so–called ‘religious right’ whose conservative ideology has seriously undermined the very constitutional foundations of the whole American modernist experiment. Fundamentalism in nearly all of the world’s major organized religions — Christianity, Judaism, Islam, Hinduism — has risen sharply in recent years in direct opposition to modernism. Many Christian fundamentalists still agree with the protestant reformer Martin Luther who believed that ‘reason is the greatest enemy that faith has: it never comes to the aid of spiritual things, but — more frequently than not — struggles against the Divine Word, treating with contempt all that emanates from God.’ (Colloquia Mensalia, ‘On Baptism,’ paragraph CCCLIII). Modernism’s displacement of the Church, monarchy, and aristocracy from positions of power and privilege continues to be deeply resented among conservatives. Each of these institutions, and especially the Church, persist in resisting the demands of modernism while supporters seek ways to reestablish its former status and role in society. 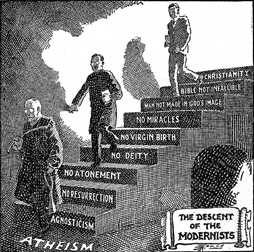 Fifty years later, in the encyclical Pascendi Dominici Gregis, ‘on the doctrine of the modernist,’ issued in 1907, Pope Pius X condemned as heretical the writings of modernist thinkers and teachers who sought to ‘reform’ and ‘modernize’ the Church, and condemned attempts to find a way to reconcile the conservative authority of the Church on the one hand with the liberty of believers on the other. It rejected the modernist belief that such matters of dogma, worship, the sacredness of sacred books, even faith itself and the Church as a whole have been subject to evolution and that the Church should now adapt itself to prevailing historical conditions and harmonize itself with existing forms of society. There is every indication that the current pope, Benedict XVI, would like to return the Roman Catholic Church to pre–modern times. Similarly, Judaism, Islam, and Hinduism, in their conservative, ‘fundamental’ forms, are likewise unsupportive of the concepts of ‘liberty’ or ‘equality’ in either a social or a political sense, and actively discriminate on the basis of class, gender, race, and unbelievers. Often under the influences of religion, conservative forces in national governments around the world have undermined and corrupted the ideals of modernism, transforming notions of freedom, equality, human rights, and democracy into self–serving excuses for invasion, subjugation, conversion, and exploitation. To the dismay of progressive intellectuals, the ideology of modernism has also become the means by which the values and worldview of the West have been promoted and imposed around the world either through imperial colonialism and economic globalization, or through the ‘conditionalities’ attached to loans granted by the International Monetary Fund, and policies serving Western interests that are forced on developing countries by the World Bank. With proselytizing zeal, local cultures, customs, economies, and ways of life in Third World and developing countries have been swept aside in the name of ‘modernization’ the benefits of which have been measured primarily in Western terms. Modernism has been the West’s most effective and influential export and in fact has been willingly embraced by many non–Western cultures for commercial, economic, or political reasons, or as a demonstration of support of Western ideals. It has also been taken up by those wishing to use the ideology of modernism to challenge indigenous tastes and authority–structures, but all are ultimately complicit thereby in the West’s modernist agenda that seeks to establish modernism as a universal norm to which all should aspire. The long–held belief that the adoption of the principles and processes of modernism always improves the human condition, however, has become increasingly difficult to sustain in all cases. Many now believe that the period defined by the modernist doctrine has come to an end and that we are now in a period of transition into a new period called, for lack of a better term, postmodernism. The term postmodernism is used in a confusing variety of ways. For some it means anti–modern, while for others it means the revision of modernist premises. The seemingly anti–modern stance involves a basic rejection of the tenets of modernism, such as belief in the supremacy of reason, the notion of truth, and the idea that it is possible through the application of reason and truth to create a better society. As doubts emerged about the efficacy of the means and goals of modernism, there arose in response various philosophical approaches that offered useful and timely tools of critical analysis, the best known of which is called Deconstruction. Applied to the question of modernism, deconstruction examines the assumptions that sustain the modernist worldview through what appears to be an anti–modernist worldview. It ‘deconstructs’ the tenets and values of modernism by taking apart or ‘unpacking’ the modernist worldview in order to reveal its constituent parts. Uncovered and subjected to analysis, fundamental modernist ideas such as ‘liberty’ and ‘equality’ are shown to be not ‘true’ or ‘natural’ to human nature but are, in fact, intellectual ideals that have no basis in the reality of the human condition. Questions are then raised about who constructed these intellectual ideals and what were their motives. Who does modernism serve? When considered in a global context, it should be clear from the history outlined in this essay that modernism serves Western social and political aspirations. Although deconstructionist thinkers, in keeping with the philosophy itself, refrain, in order to avoid the presumptions of modernism, from proposing a corrective to modernism’s failings, deconstruction’s critique of modernism has offered alternatives that have been employed by some to describe the features of postmodernism. As an anti–modernist movement, therefore, postmodernism is seen as rejecting those elements that comprise the modernist worldview, including the ideas of truth, self, meaning, and purpose. In this respect, deconstructive postmodernism is seen by some as nihilistic. 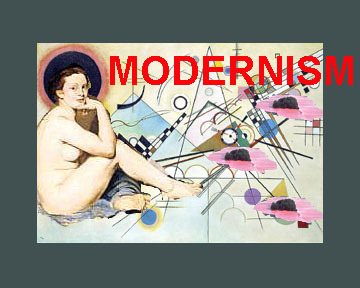 In contrast to the anti–modern position, an alternative understanding seeks to revise Modernism’s premises and traditional concepts, which have become institutionalized, corrupt, and entrenched. In support of the core values of modernism — liberty, equality, rights, the pursuit of happiness — the aim is to challenge the logic of the oppressive modernist state and undermine the legitimacy of prevailing conservative forces. Sometimes termed constructive postmodernism, it seeks to provide a new unity of scientific, ethical, aesthetic, and religious intuitions. It rejects not science and religion as such, but only those scientific approaches and religious practices in which only prescribed data and beliefs are permitted to contribute to the construction of our worldview. Constructive postmodernism seeks to recover truths and values from various forms of pre–modern thought and practice. This is necessary because the pursuit of modernism, especially in its unfettered capitalistic and consumerist manifestations, is not sustainable and threatens the very survival of human life on the planet. Aspects of constructive postmodernism will appear similar to what is also called ‘New Age’ thinking. The possibility that mankind is standing on the threshold of a new age — the Age of Aquarius, which is currently replacing the 2,000–year–old Age of Pisces (according to calculations based upon of the precession of the equinoxes) — informs the more ‘spiritual’ side of postmodernist thought. The postmodern is deliberately elusive as a concept, due in part to its willingness to accept, in contrast to modernism, uncertainty and ambiguity. Whereas Modernism was concerned with reasoned progress and logical conclusions, postmodernism respects ‘process’ and ‘becoming,’ preferring openness, transparency, and the unbounded. The post–modern artist is ‘reflexive’ in that he or she is self–aware and consciously involved in a process of thinking about his or her cultural self in history, in demasking his or her own pretensions, and promoting processes of self–consciousness. But, in this period of transition when a massive and unpredictable sea–change appears to be occurring in cultures around the world, it is impossible to predict the future. There is no way of knowing whether postmodernism will assume a nihilistic, potentially anarchic, anti–modernist form, or become a desirable variant of modernism with a spiritually heightened and self–conscious awareness and sensitivity to cultural, ethnic, and human conditions and experiences. It may be neither. In my opinion, the time has perhaps come at last to engage the other half of the human race, the women of the world. Modernism’s most regrettable flaw is that it is predominantly a male construction, an intellectual doctrine formulated and sustained by well–intentioned men. Despite its promises of liberty and equality, its most glaring failure is the continued subordination of women in the world today. Long ignored and neglected by ancient and oppressive patriarchal systems, it is now time for the world to adjust to and be guided by women. Top of the Page 5. The End of Art?